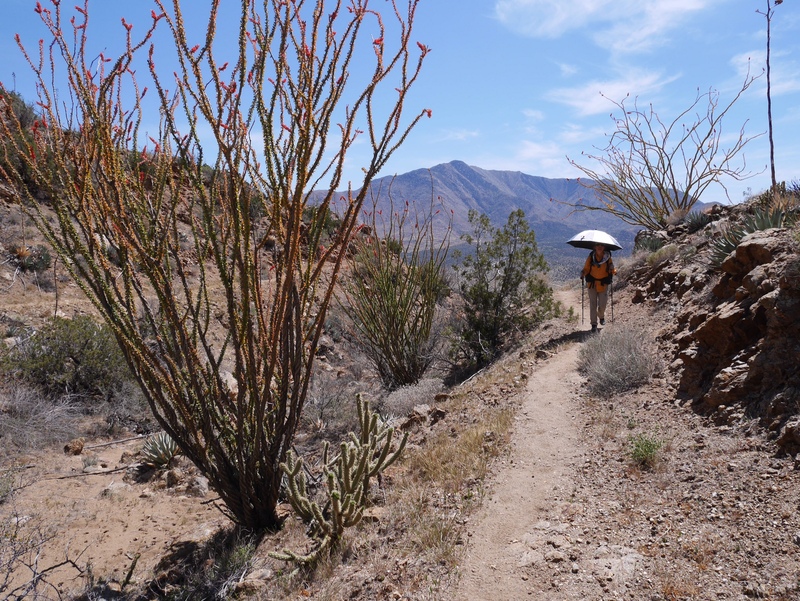 Today’s section of the Pacific Crest Trail was in Anza-Borrego State Park and the desert was full of blooming flowers and cactus. A very warm but beautiful day of hiking. This morning we hiked six miles to a highway intersection called Scissors Crossing, where we met our friend JJ. He is working on a photo project about PCT hikers and has been posting excellent work online at www.pct.photography. He also brought us three gallons of cool water from Julian, which was very much appreciated. It was a steep climb into the San Felipe Hills with packs heavy from the water, but it was amazing to see all the blooming flowers along the trail. We camped under the stars again tonight and according to my astronomy app, watched the International Space Station shortly after sunset. Another wonderful day on the trail. Photo: A warm but beautiful hike through the blooming ocotillo and other cactus in the San Felipe Hills.